Uglyworld #29 - Wage Watching TV With an Irn-Bru, originally uploaded by www.bazpics.com. 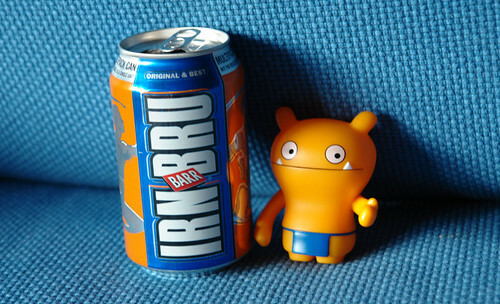 When I got home from work this evening I found Wage already relaxing on the couch with a can of irn-bru, he looked pretty cool against the blue material of the couch so I asked Wage if I could take a quick picture. His first reply wasn't nice enough to be able to share with you all, as he was more concerned with me blocking his view of the TV at the time (he was watching the original Austin Powers film). When he noticed I had a bag of sweets with me, his mood changed completely - check out the eyes and hand - greedy little monkey!! !